An amp sim plug-in that goes a step further. Innovative modelling technology in software form. Not a one-stop amp and effects package. 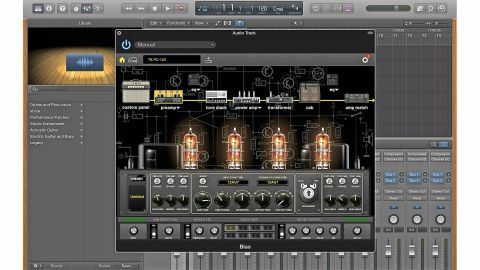 We first came across Positive Grid's BIAS iPad app that took amp simulation on that platform to new levels of detail, offering the chance to get in and tweak amps at a deep level, change valves and the like. Now, while iPads are great for many things, not everybody has one, so it's very welcome news that Positive Grid has released a computer-based version of BIAS in AU, VST, RTAS and AAX plug-in formats to use with your Mac or Windows DAW. BIAS Desktop is the basic version, but there's also a BIAS Professional, which sports additional features. There are no effects as such in BIAS, just pure amps covering plenty of well-known makes and models, generally sounding richly authentic and feeling good to play through. You get 36 amps to start with, grouped in sound categories such as Clean, Metal, and so on. Each amp's signal path is constructed from a string of components - a customisable panel, preamp, tonestack, power amp, transformer and a cabinet with a choice of two moveable mics. "Any amps you create can be shared online with other BIAS users via the built-in ToneCloud facility"
In addition, you get a couple of eight-band EQs that can be inserted at various places in the chain, plus a noise gate and room simulator. For editing, you can swap whole components: change a Fender tonestack for a Marshall one perhaps, or get into the adjustable parameters of a component, such as changing the valves or moving the plethora of knobs for some very subtle tonal shading. You can save any amps you make into the memory and assign eight favourites to a front-panel grid for instant recall with just one mouse click. Any amps you create can be shared online with other BIAS users via the built-in ToneCloud facility, and, likewise, you can download amps that others have created. BIAS Professional takes things further by adding three Amp Design Expansion Packs (Glassy, Crunch and Insane), but its unique feature is Amp Matching Technology, where you can make any BIAS amp match the tone of a real-world amp/cabinet/microphone setup. First off, you need to choose a BIAS model that's closest to your target sound, take a quick sample of that target sound by either playing live through a mic'd amp or playing it back from a recorded track on your DAW, and let the software carry out the tonal compensation and enhancement needed to make the BIAS amp model accurately match it. This works really well, allowing you to effectively model your own amp but, more than that, you can also get access to exclusive models on ToneCloud that others have matched, with all the possibilities that that entails. Virtual amp building on a computer isn't a new concept: Peavey's ReValver started and continues the trend, but BIAS takes it in another direction, especially with the opportunities that the amp matching facilities and ToneCloud opens up. If you are looking for a general amps and effects plug-in for your computer, the lack of effects could direct you elsewhere, but if you want open-ended, quality amp modelling to expand your tonal horizons you'll find it here.